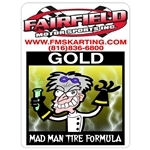 Mad Man tire formulas Gal. Mad Man tire formulas Qts. Biting Blue outside prep Gal. 7 Quarts of Mad Man tire prep. 1 quart each Red Inside,Blue Outside,Purple Outside,Green Outside,Gold Outside,DST and Tire wash. Put yourself up front this season. Mad Man prep has been winning races all over the country. Simple and easy to use! You will receive a prep guide with your order. Feel free to call with any prep questions before or after ordering. I will get you going on the path to the front. Steve Fairfield (816) 836-6800 Purple Power is a perfect intermediate prep. We use it on all border line tracks. Not low grip and not high grip. Has worked well on hard, slick tracks as well as dry tracks. Purple power will soften 3-6 points. If you are on a low bite track you will need to be using mean green at the track. If you have to much bite switch to purple power. Biting Blue is a great tire conditioner. Use it during the week to add bite to tires. More coats equals more bite. You will see very little drop in durometer readings 1-2 points. Biting Blue also works well as a trackside prep to fire off tires especially on higher bite tracks. If not racing I will wipe all my tires with Biting Blue once a week to keep them fresh. Radical red inside prep Gal. Mean Green outside prep Gal. Radical Red is an inside prep only. It is the most versatile inside prep available. Roll the tires once and you are done. We will re-roll tires if we haven't run them for 3 months. Only re-roll with half of what you originally used. We have won races on track conditions from wet ,cold and slick to hot, high grip, calcium tracks. We use varying amounts depending on track conditions. For every oz used the tire will drop approx. 2-3 points. Roll tires for 24 hours. It will take 4 days for tires to drop on the durometer. Radical Red works great on all brands of tires. Get in a habit of marking the number of ounces that you have rolled inside each tire. The more inside prep equals more side bite. Mean Green is used for lower bite tracks. If you have never used this product you are in for a treat. Put on a thick coat and hold on. You can soften a tire 20-25 points if needed. Mean Green is best when there is some moisture in the track. When the track is wet make sure you go to the grid with your tires wet. If the track is hard and has very little moisture go to the grid with dry tires or switch to Purple Power. Mean Green is good for getting tires to the desired durometer at home and then choosing trackside prep when you see what the track condition is like. Gold is a very aggressive softener and grip agent. It has been around since tire prepping started. Some call it goat pee. It will soften a tire down to 20 on the durometer if needed. We prefer gold when the track is harder and faster. We will cut it 50/50 with DST or Blue to lessen the softening effect and still add bite . Mean Green outside prep Qt. Biting Blue outside prep Qt. Gold is a very aggressive softener and grip agent. It has been around since tire prepping started. Some call it goat pee. It will soften a tire down to 20 on the durometer if needed. We prefer gold when the track is harder and faster. We will cut it 50/50 with DST or Blue to lessen the softening effect and still add bite. Biting Blue is a great tire conditioner. Use it during the week to add bite to tires. More coats equals more bite. You will see very little drop in durometer readings 1-2 points. Biting Blue also works well as a trackside prep to fire off tires especially on higher bite tracks. If not racing I will wipe all my tires with Biting Blue 1-3 times a week to keep them fresh. Radical Red inside prep Qt. Purple Power is a perfect intermediate prep. We use it on all border line tracks. Not low grip and not high grip. Has worked well on hard, slick tracks as well as dry tracks. Purple power will soften 3-6 points. 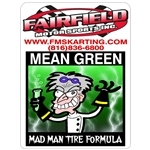 If you are on a low bite track you will need to be using mean green at the track. If you have to much bite switch to purple power. Radical Red is an inside prep only. It is the most versatile inside prep available. Roll the tires once and you are done. We will re-roll tires if we haven't run them for 3 months. Only re-roll with half of what you originally used. We have won races on track conditions from wet ,cold and slick to hot, high grip, calcium tracks. We use varying amounts depending on track conditions. For every oz used the tire will drop approx. 2-3 points. Roll tires for 24 hours. It will take 4 days for tires to drop on the durometer. 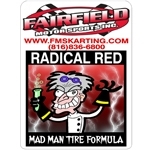 Radical Red works great on all brands of tires. Get in a habit of marking the number of ounces that you have rolled inside each tire. The more inside prep equals more side bite. Mad Man Tire wash is a great product. Spray it on with a mist then wipe tire clean with a towel. It will keep the prep in the tire instead of washing it out with water. This tire wash will dry fast and allow tire to take prep better. Give it a try and you will be hooked. 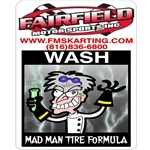 Mad Man Tire wash is a great product. Spray it on with a mist then wipe tire clean with a towel. It will keep the prep in the tire instead of washing it out with water. This tire wash will dry fast and allow tire to take prep better. Give it a try and you will be hooked.